Our client came to us with three primary requests: she wanted the “French Provincial” kitchen of her dreams with lots of storage, an increase in natural light, and seating for about 8 people to accommodate future cooking classes she plans to host. The challenge was gladly accepted. 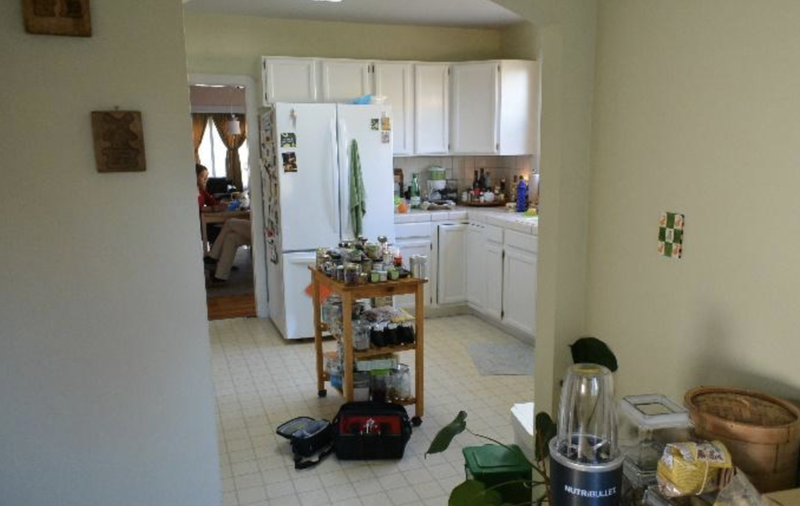 By opening up the three small spaces that originally made up the kitchen, laundry room, and dining nook, the size of the kitchen was significantly increased. Adding a full light glass door to the back deck unified the indoor and outdoor spaces, while also adding some much needed natural light. The wall between the dining room and kitchen was also removed to allow the natural light to flow seamlessly through the space and give a more open feel. The “French Provincial” aesthetic was achieved through fixtures and finishes. This included custom weathered cabinetry, a wooden island with turned legs to give the feeling of a piece of antique furniture, antique bronze metal faucets and pulls, and cobblestone reminiscent tiles on the floor.